Contrary to the currently fashionable egalitarian blank-slatist hysteria, the Greeks universally believed that an individual’s qualities were the fruits of nature and nurture. Even the sophist Protagoras, a thinker of democratic leanings and an educator of the people, argued: “Teaching requires natural endowments and training; one should begin to learn when one is young.” The recognition of inborn human inequality in no way implied that the well-endowed should rest on their laurels. On the contrary, all humans should constantly work to maximize their potential through training and education. The Greeks developed techniques for individuals to cope with and live well in the harsh world they inhabited. They were remarkably cognizant of the means available: good education, constant training, healthy habits, and socialization with good individuals. Through self-discipline and piety, reason could rule over emotions, pleasures and pains. The Greeks considered a life of belly-chasing, death-fearing, and comfort-clinging to be an evil, subhuman one, no better than that of the lower beasts. Politically, moral education of the citizens was considered practically the first duty of the state, to be achieved through training, culture, public religion, and laws. For too long, Western civilization has operated in contempt of the blood. Western man does seem to have a tendency to love contemplation of the divine. Yet higher consciousness, which may reasonably be deemed a supreme goal of intelligent life, is only a flicker in the dark if it ends with one’s bloodline. As even the blue-eyed Buddha in India, a contemporary of Socrates, observed: “this body . . . is what [the ascetic’s] consciousness depend on, what it is bound up with.” And the body assuredly derives from the blood. Universalist religions especially have often forgotten this, urging the most pious to become childless monks or priests. There is a case for our best minds to not be distracted by family life so that they may fully pursue philosophical truth and political activism. But I would limit that to a minuscule minority. The best of our people must know they have a duty to perpetuate their line. Humans are by nature genetic, social, and cultural creatures, our political goals naturally flow from this: the genetic, social, and cultural improvement of our people. European Identitarians and other violators of political correctness must bear the burden of being considered heretics. This is not only painful and unglamorous, but indeed can prove financially and socially ruinous. Yet, here too, we find inspiration in the Greek tradition and find that not all is new under the sun. Greek philosophy itself, as it comes down to us, really flourished following the eternal example of Socrates. In no other man is the contradiction between social acceptability and the pursuit of truth so apparent. Socrates was a good soldier when Athens called upon him to fight for his community. He was also a father and family man, though perhaps a somewhat neglectful one. He preferred to live in relative poverty, questioning those who claimed to be wise, and refusing to take corrupting fees for his teachings. Socrates’ self-discipline was legendary, being immune to cold, drunkenness, or sleepiness, spending hours or whole days and nights meditating. The detail of Socrates’ views will remain forever unknown to us. But we know some things by his way life. Describing himself as the “gadfly” of Athens, Socrates was what we would call today an ethical “troll”: urging his fellow citizens to become aware of their ignorance and showing established authorities to not be as wise as they claimed. He praised the value of political expertise as against the assumptions of Athenian direct democracy. He said that the only genuine good, for an intelligent being, was in the good of the soul, rather than external goods or even health. For if you give a foolish man wealth and power, he would only use these foolishly, at best wasting them and perhaps even harming himself further. And indeed, is not power and wealth without purpose the very story of America and Western civilization itself over the past century? We are victims of our foolishness and apparent successes. Socrates fell foul of the democratic authorities of his day. He was accused, like all unpopular truth-tellers, of “impiety” and of “corrupting the youth.” Do we heretics today not know these charges well? The women too lamented. But Socrates would not back down. In the face of the mob, Socrates put his words into practice, preferring death to a life in which he could not live by philosophy. The story, as magnificently told by Plato, is all the more poignant in that Socrates refused to flee his execution. 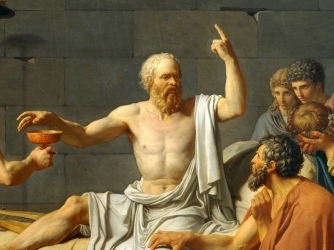 Socrates was no liberal: while boldly questioning convention, he honored the right of the Athenian state to do as it saw fit in the name of public morals, and Socrates submitted, for without respect for the laws there is only anarchy. By his willingness to sacrifice himself, the philosopher shows his superior piety, his adherence to his own internal moral law, itself acquired through training and reflection. This is piety a mob cannot even conceive of, let alone have. The egalitarian executioner is shamed forever, the philosopher by his exemplary death becomes immortal in the minds of men. Socrates’ sacrifice inspired all the Greco-Roman philosophical schools that endured until the end of antiquity. In terms of individual ethics and lifestyle, all merely elaborated upon his principles. His example lives with us still. Remember that you’ve only one life and death is inevitable, that we are all subjects of the laws of the universe whether we like it or not, that you have nothing but your soul, and that your blood begot your spirit. The Emperor Julian, that final flowering of the Hellenic spirit, showed the way in recalling the two fundamental principles of his philosophy: “Know thyself” and “restamp the common currency.” In other words, discover your own nature and then, based on this truth, change the culture, change what people value, for what they value today is utterly worthless. And there will even be joy and that rarest of things in our nihilistic age: a life full of meaning. For as Julian also said, those who have had a taste of the truth, however small, are seized by that “sacred frenzy,” that ecstatic feeling which inspires us to order our life accordingly and to zealously fight to enlighten our kinsmen. The threats faced by our race today are unprecedented. Many individual European tribes have been exterminated in the past. But never before as in this century has our entire race faced such collective decline and utter dispossession in our ancestral homelands. Yet, on a personal level, the struggle for truth remains in many ways similar to that faced by our Greek forefathers. If we dare to learn from our ancestral wisdom and to live by that wisdom, if words are met with deeds, every day, great and small, we need fear nothing. Rupert Gethin (trans. ), Sayings of the Buddha: A selection of suttas from the Pali Nikayas (Oxford: Oxford World’s Classics, 2008), “The Fruits of the Ascetic Life,” p. 30.